I originally submitted this for publication in Line of Fire 16 but stuff kind of happened and here we are. I tried to make a scenario where the Soviets invade West Germany after the end of the Vietnam War, well before the US starts making those wonderful and deadly M-1 tanks. I've also tried to think of how chemical weapons would work in the game. I'm not totally sure it works but I tried my best on it. I also tried to take into consideration the ability of the M-60 Patton to be used for indirect fire. Lots of little experiments in this scenario. 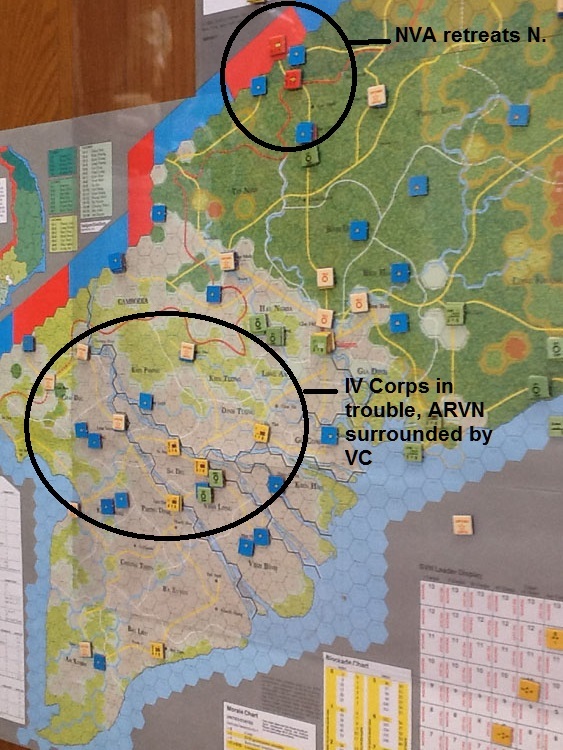 Well, I can safely say now that I've finished a tour of duty in Vietnam: 1965 to 1975 from Victory Games. And what a ride! Between the extreme of busy-ness of work and home right now, I've shoehorned in the time required to play about as much of it as I can at the moment. Many games, you can sort of sit with for an hour or two after work and lose yourself in them despite being already tired. Vietnam is not that kind of game. It demands a lot from the player, both in terms of time committment and mental energy and if you don't give it the right amount of time and concentration and respect, you'll probably get burned pretty badly. Rather than watch things degenerate into farce, I've decided to stop the game here and take stock of what happened. South Vietnam is in political chaos as two successive coups have happened in the fall and winter season. The generals in charge of the ARVN Corps are demoralized and disloyal, preferring to focus on bitter in-fighting rather than getting the job done of securing the countryside from an increasingly bold VC presence. Fall 1965 starts off with the US choosing to save its air power for operations in the field. No bombing of the Ho Chi Minh trail or the North happens at the start of this season. Big mistake. The VC use the trail to good effect, throwing in men and supplies everywhere, especially in the interior near Kontum. The Viet Cong take control of several provincial capitals in this area and they now have a stronghold from which to launch attacks on the US and ARVN forces further to the east. The SVN capital finds itself under siege as rumors of NVA regiments moving down the trail are preparing for an offensive against Saigon itself. Summer of 1965 has just ended and gives way to fall colors, Hogan's Heroes, Sandy Kofax, The Hollies, and a deepening conflict in Vietnam. The first hints of change in American culture begin with the protests of thousands of people across America on October 16th. Well, I never thought I'd get through a single turn of Vietnam 1965 to 1975 but here we are in Fall 1965. Over the summer months, the Viet Cong have been steadily gnawing away at South Vietnam's population support. Starting the summer turn, most of my ARVN divisions ended up being effective, except for the 2nd division up in Quang Nam near Da Nang. I didn't worry about it too much because I had the 2nd and 3rd Marine regiments sitting up there ready to pick up the slack for them.